In the pressroom in Brazil in 1991 a senior Formula 1 journalist looked up from his computer, peered at a television screen for a few moments as Mike Hakkinen's Lotus was passing through the picture and declared with a certain nonchalance that "That boy is going to be a World Champion one day". And sure enough he was: twice in fact. Back then Hakkinen was a happy-go-lucky youngster enjoying his second race in F1. He had been picked out by Peter Collins, a man with an extraordinary eye for spotting talent, for Team Lotus. It was a huge risk for Collins and his partner Peter Wright, who were trying to rebuild Team Lotus without much backing. They believed that talent and good engineering would bring in money and took the risk that Hakkinen and Johnny Herbert would deliver the goods. And they were right - at least in the short term. Mika didn't say much, even then, but he enjoyed the high jinks that took place with the gregarious (one might say "mad") Herbert. The pair were a breath of fresh air, Herbert always quick with a wisecrack and Hakkinen riding around the F1 paddocks on a monocycle. Mika's ability to balance could be seen from the way he drove a racing car and was developed from the age of six when he started karting. It helped that when he was nine he was racing Volkswagen Beetles on frozen lakes in company with his friend Mika Sohlberg, who went on to become a World Championship rally driver. He bought his first racing car - a Formula Ford - from JJ Lehto and quickly made his mark and with Marlboro behind him was sent to England in 1988. Three years later he was in F1 and by the end of 1992 he was taken from Lotus to the Marlboro McLaren team to join Ayrton Senna and Michael Andretti at McLaren, initially as a test driver but after Andretti was sent back to the United States as team-mate to Senna. The timing was not perfect. McLaren had lost focus after too many years of success and there were a series of different engines one after another: Ford was followed by a dalliance with Chrysler and then a Peugeot deal in 1994. Then McLaren switched to Mercedes-Benz. Hakkinen was the man who did much of the development of the Mercedes-Benz engine but at the end of 1995 in Adelaide he suffered a tire failure and crashed heavily into a concrete wall. His life was saved by doctors who gave him an emergency tracheotomy by the side of the track. At such times F1 journalists know little more than spectators but those who have been around see things happening amongst the medical people and know what it means. I must admit that I retired quietly to my desk with the feeling that I would have to write his obituary. Mika came back from the dead with incredible speed. But he was a changed man. He was frightened but he overcome that fear and gradually he began to relax again. By 1997 he had a car that was capable of winning races but he had to wait until the end of the year before Michael Schumacher's assault on Jacques Villeneuve at the European GP opened the way for him. He won the World title in 1998, winning eight of the 16 races and won again in 1999 although he was undoubtedly helped by the fact Michael Schumacher was out of action because of a broken leg. 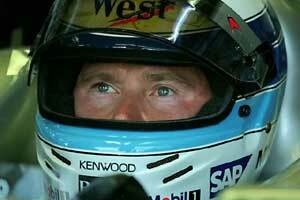 Hakkinen remained remote and sometimes difficult to understand. He could be an iceman under pressure but at the same time he could crack under pressure in the most basic way. At the start of 2001 Mika suffered a suspension failure in Melbourne and had a huge accident. He did not say much about it at the time but he was shaken and began to ask questions about whether he had pushed his luck too far. Ron Dennis, who been such an important influence for Hakkinen during his recovery after Adelaide in 1995, had become in some respects a father figure and in the end Mika confessed to Ron that he wanted to retire. The pressure came off and at the end of 2001 Hakkinen drove to two spectacular victories and then he disappeared off on "a sabbatical". Anyone who knew what had happened knew that Mika was not coming back but one must give credit to Dennis for letting him go in a graceful manner - and making sure that he was sure that retirement was what he wanted. There are times when one is glad to see a great champion go because too many of them do not know when to stop. Hakkinen got it right and so brings to an end the story in as happy a fashion as his career began. Mika may not have had the gift of talking a good game - but he certainly drove one.